My proposal for coming to the American Academy in Rome as the National Academy Affiliated Fellow was rooted in expanding the narrative sense of my pictures. I wanted to find a delicate place of tension between the pure plastic form and surface of a picture and a sense of story, a larger drama and figuration. Lately, these mallet forms had emerged as a narrator, army or protagonist, placed in a sort of fantastical landscape space. In the Pantheon, the viewer is subsumed within the set of architectural ‘forces’ present, There is a sphere and a cylinder, and they have an effect on the scale of the scale of the body. Distance, volume and spatial relationships all combined for me into a state of spiritual bafflement that I could not understand, but felt completely connected to. I started to work in my sketchbook, and it was as though I could feel the spiritual energy of the space in the very marks I was making. As has happened to in the Rothko Chapel and other places, the drawings started to just make themselves without a whole lot of interference from me. It was a spiritual state that does not happen often. I started to transfer that energy into my larger drawings. I set up the studio, and pinned small drawings to the wall. I started several sketchbooks, some of which I brought here today. I started to get up every morning really early, make my coffee and work, looking out over Rome from my drawing table. I walked a lot and wanted to feel free about what I was seeing. I started to visit as many places as possible and taking materials with me, rolled-up papers, pencils and panels, along with enough 1 Euro coins to illuminate the paintings for more than a few minutes. After an hour or two, I settled in and found out new small things about the work. For example, in Caravaggio’s St Matthew and the Angel, I noticed that a leg of the bench that St. Matthew is kneeling on goes over the painted floor of the picture, which tilts the entire composition, and my perception of it. I’d take them to churches, to museums and to the Villa Dora Pamphilli, a beautiful park right behind the Academy. 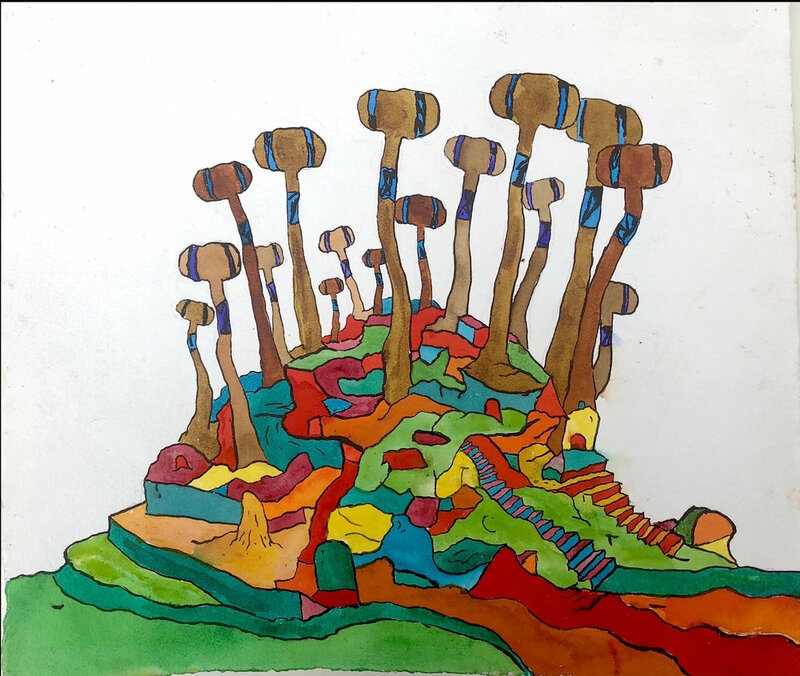 I started to draw from the uniquely Roman umbrella pines. As I worked, things started to open up and a sense of freedom surrounded the work. 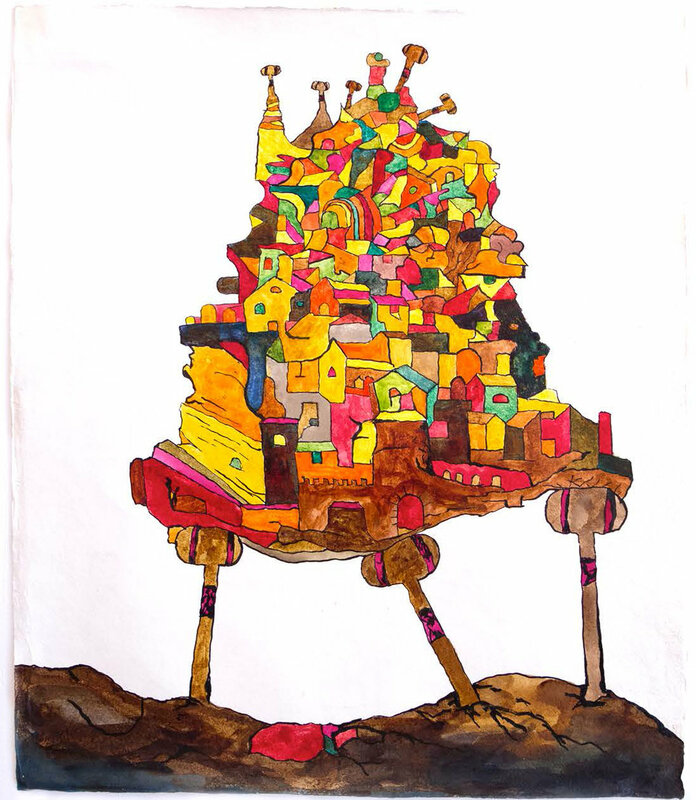 I would take forms from one place and put them with things from other places in my drawings. I loved the big round mound of the Castel San Angelo, and it made its way into the nomenclature. The Bernini show at the Borghese Gallery was astonishing. Walking through it, I found myself in the same spiritual space as I did in the Pantheon. So, moments in those sculptures started to really show up in the narratives. Daphne’s hair in the sculpture “Apollo and Daphne” was one thing that filled me with wonder. Architectural details and the figures in paintings became narrative players on a stage. The altar at Santa Maria Maggiore seemed as a diminutive ‘hut’ that sat inside the large space of the church. 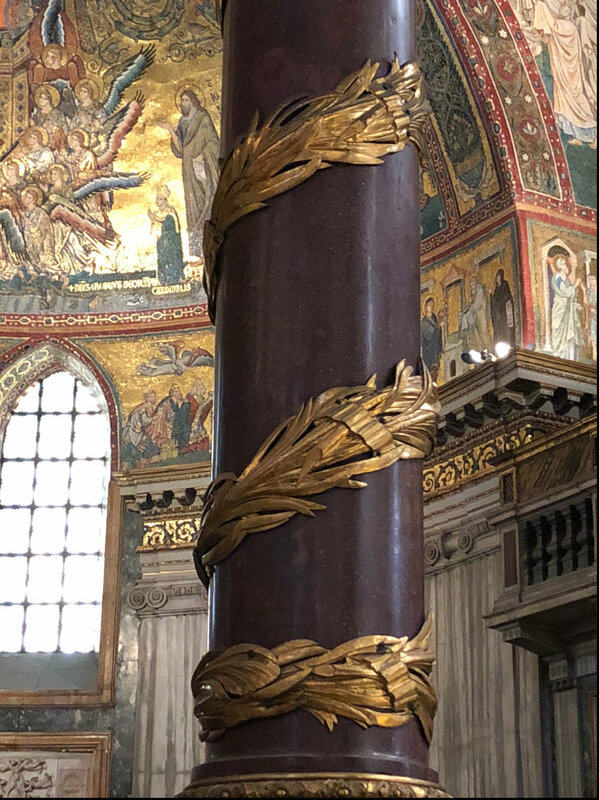 It had these amazing bronze leaves wrapping around its columns. So I stuck them into my drawings, inventing a new kind of image. The statues of the 12 Apostles at San Giovanni en Laterno became a kind of Sacred Gathering, jury, or James Bond SPECTRE meeting, each one in small self-contained box or throne. I started to use them in the work. I felt a sense of freedom as I picked up a brush. These small pockets of energy were all around, and they encouraged and fed the work. 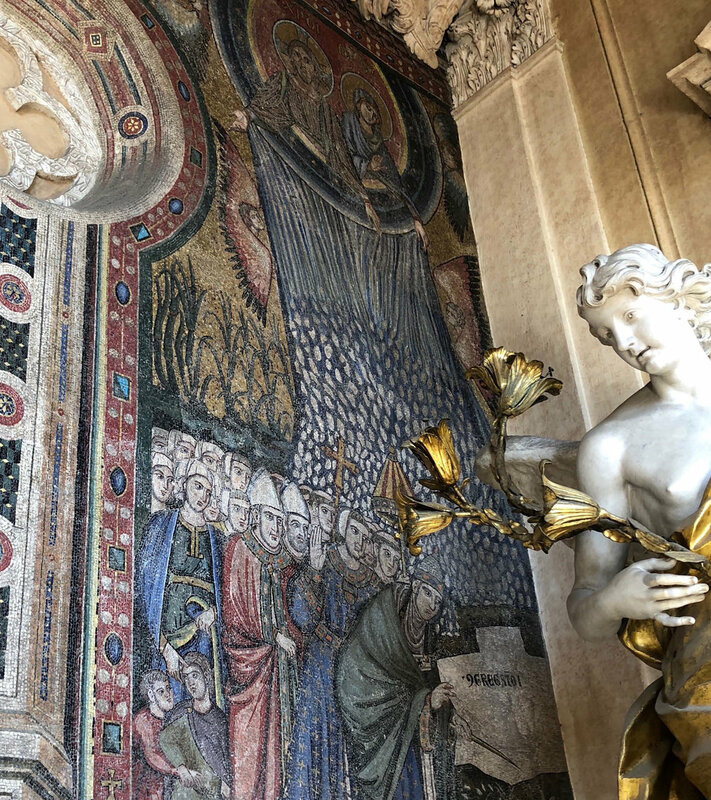 A small mosaic from Santa Maria Maggiore joined the Pantheon and San Giovanni in Laterno in a strange scenario, one I don’t claim to understand , a highly desired state. What are these figures doing? Where are they going? Is this a kind of meeting or quest, festival or concert? This energy carried into the studio, which was starting to fill with drawings, paintings and postcards. I would see columns standing in groups, still supporting a load, while the rest of the building was gone. I thought of them as a kind of tribute and caretaker of the past, something holding fast against modernity. In Pompeii, there were three big stubby stones on all the streets that were born of civil necessity, and somehow seemed so funny. So they showed up in the work. Architectural space, pictorial space, and the spaces between the self and others would all create a kind of power that I sought to embody in the pictures. ...and an archway at the Church of Santa Maria del Popolo that looked like horns or a helmet..
After working for an hour or two at San Pietro en Vicolo, San Luigi di Francesci or Santa Maria Maggiore, I would have wonderful conversations with the guards in my elementary Italian. My fanboy enthusiasm for buying six half-hour tickets to Piero della Francesca’s frescoes in Arezzo was met with equal pride and grace. I had called them a few times the previous day to make sure I had the logistics right. When I got there, introduced myself and they said “Charles!”, as thought I was a lost relative home at last. As I walked and looked, the art, architecture, sculpture and people of Rome became entirely present actors in a larger historic ‘painting’ of self and spirit. I found this everywhere. I was living my days like I was entering into my own paintings, as the protagonist finding a sense of connection with the world. I felt that Rome is a place where the energy of the connections I felt with the great paintings extended to everyday life. It is a kind of magic that fills me with wonder. Each day in the studio I would try and create that energy in the work. I was entranced by the Romanpaintings at the House of Livia on the Palatine Hill. Art, architecture and history are bonded to the population, and they gave themselves back to it. I found the whole city to be a kind of palimpsest, from the Sistine Chapel to the humblest of streets, layer upon layer of monuments, ruins, residences, paintings, statues, parks, and people living, building and destroying, forgetting and remembering over thousands of years. 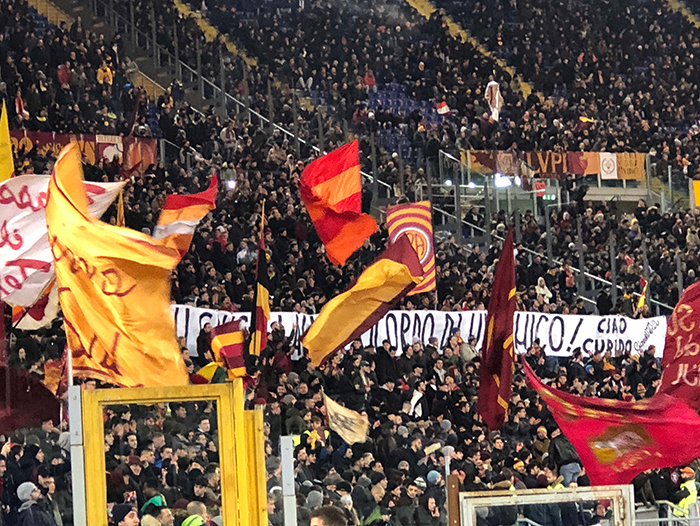 I went to an AS Roma soccer game, and I could never have imagined the enthusiasm of the fans. Those very big flags were flying the entire game. The place where I bought art supplies has been in the same location since 1820. And of course the coffee! Historical space, or what I came to see as the compression of time, was part of my everyday life in Rome. I came to feel that the mallet forms in my drawings could represent the self, the other, or the spirit of human connection and inspiration I felt as I sipped on Gabrielo’s obligatory latte doppio in the morning at the Academy’s cafe, discovered the architecture of Borromini, walked the Via del Corso on Saturday or drew from Michelangelo’s Moses. The mallets I painted were a stand-in, a protagonist for the discovery of inspiration, hope and connection. Rome is a place where history and the present are one, where the energy of the city and its people echoes the great art of the past. It has elevated my perspective on making art and on understanding how to move and exist in the world. The American Academy in Rome was a natural extension of this Roman magic. It is an extremely well run place that has developed its own traditions and layers of meaning over the years. The people there were extremely dedicated to the place, and fostered an atmosphere of creative freedom, warmth and grace that I will never forget. One of the greatest things about the Academy is that they gather talented and articulate people from diverse disciplines and put them in a place where ideas and craft can be exchanged with ease. I was surrounded by incredible, curious minds. In a space of a few days, I had great conversations with a book designer from the Netherlands, a researcher of building techniques in Puglia having to do with a marvelous thing called a “Squinch Dome”, and a scholar from Brazil who was researching minute grammatical errors in18th century translations of Aristotle. I had a number of great exchanges with the Arts Director, Peter Benson Miller, about the work of the Academy Fellow Philip Guston, and I was able to source an autograph letter for him that he integrated into a lecture he gave at the New York Studio School in February.It was interesting to hear how archaeology and art history are similar: they look through documentation and the real world for clues and posit theories about how things actually happened, and they, as well as I have occasional moments of clarity. The historians helped me to imagine the Romans in 30 B.C. going about their day or Michelangelo signing in every morning at the Vatican to paint the Sistine Chapel. I hosted a series of “Draw Jams” in my studio that brought other Fellows and their families into my world. Lots of fun was had by all. I have a show of the work up now at Steven Zevitas Gallery in Boston. I was able to walk through it with an architect that I’d met at the Academy, Nader Terhani. We spoke about the work in architectural terms, and he related it to his experience in Rome, and to the architecture he saw there. He saw the impression of Rome everywhere. It was a marvelous exchange, which took me back to sitting on an old stone, painting Bramante’s Tempietto as a kind of junior-sized chapel; like a “Mr. Potato Head” tiny muffin populated with a colony of small croquet mallets, which contained so much beauty, form and function. I spent a cold, wet afternoon working there, and could have spent a week. 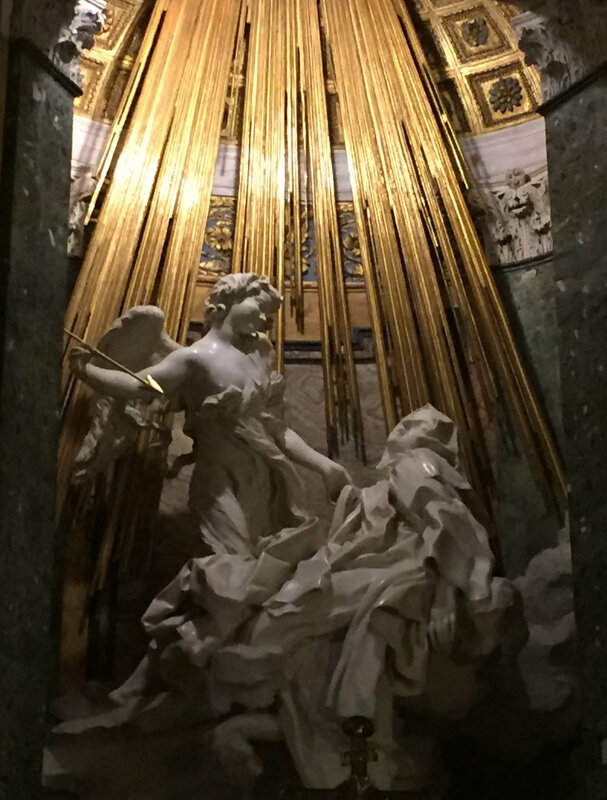 I came to feel that my time in Rome had been a success: I was able to absorb the work in the terms of another discipline through a shared experience of a place. This is me sitting on the Palatine Hill drawing. Rome has a unique magic that had a very deep effect on me. It’s something that I can access when I make new work inspired by my time there. Those exchanges, and the time and freedom to have them, makes the National Academy Affiliated Fellowship to the American Academy in Rome a unique and invaluable resource for an artist, and one that has elevated my practice in a profound way.